"Great with stew or soup!" Combine biscuit mix, pepper, and 1/2 teaspoon garlic powder in a large bowl. With a fork, stir in milk and cheese until mixture forms a soft dough. Drop by 1/4 cupfuls onto greased cookie sheet. Combine butter and remaining 1/4 teaspoon garlic powder, and brush on top of biscuits. 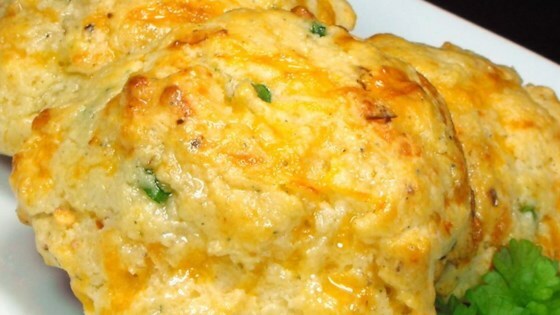 Check out these quick and tasty cheddar biscuits. A little dry..would rather use the buttermilk recipe and just add the cheese, red pepper flakes and garlic to that. This was a very easy and very tasty recipe. LOVED The biscuits. THANKS! Followed other suggestions and was very generous with the garlic powder and red pepper flakes. YUM!!! Good even after they cool, but best when piping hot from the oven. Thanks for posting! very good!!! will add salt next time though.